1. Prepare sandwich with lunch meat of your choice and place your sandwich on a plate. 2. Slice your baby carrot in half and place on either side of your sandwich for arms. 3. Slice your piece of cucumber in half and place underneath your sandwich for two legs. 4. Using your knife, slice away the insides of your piece of tomato leaving only the outer ring. Slice this outer ring into a smile and place this smile on your sandwich. 5. Slice your red grape in half and place on your sandwich for a nose. 6. Slice your piece of mozzarella cheese into 2 circles for the eyes and 7 small triangles for the teeth. Place these details on your sandwich. 7. Finally, slice your black olive in half and place 1 half on each of the mozzarella eye circles. 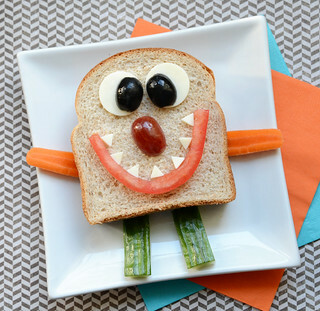 This sandwich is so silly, it’s sure to being a smile to your kid’s faces. Even better – it’s so easy to make, it’s also going to make you smile too. Enjoy!